NIOSA is my favorite event of Fiesta. The cascarónes, buenelos, Polka dancing, stacks of beer cups (with confetti in them) and chicken on a stick make me so happy. When my life changed a little over two years ago with the birth of Natalie, my Fiesta baby, I had a serious question to solve. Can you do NIOSA with a young one? While you certainly can, you need a little luck, patience and planning. Here’s how I did it—along with the associated costs. NIOSA is renown for its crowds—you’ll feel like a piece of confetti in a packed cascarón if you show up later in the evening. To mitigate this, you want to show up right when the gates open up at 5:30 p.m. We made the mistake and got there at 5:00 p.m. This resulted in thirty minutes of waiting in the sun with a fussy baby. Natalie getting ready to get her second ever NIOSA on! You can also minimize your wait time in line and purchase your tickets in advance. This was another misstep that we made. Not only are they more expensive at the door ($15 versus paying $12 at HEB, though children 12 and under are free), you have to wait in line to get them. 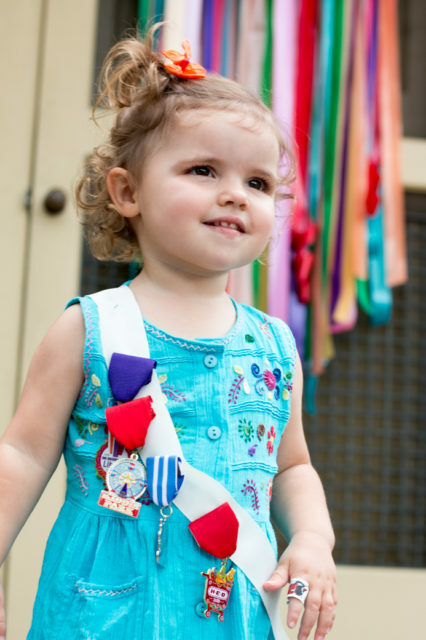 Remember, with a little one you are on the clock and you got to maximize every minute. 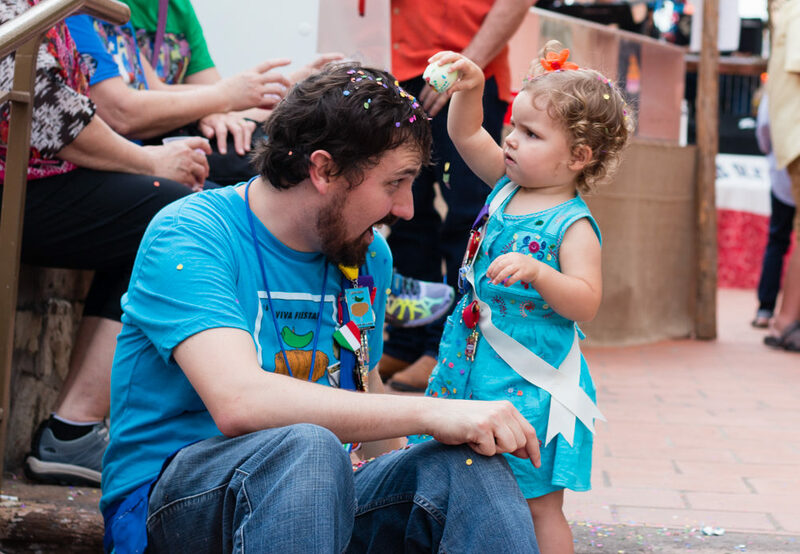 The Via bus may be the most economical option to get downtown during Fiesta, but I don’t want to waste any of my Fiesta time waiting in line for the bus with a baby. And while Uber and Lyft can get you a car instantaneously, I don’t know how the whole “car seat” situation would work out with them. This means that you’re going to have to park. To me, the best post to do this is the lot next to Schilo’s Delicatessen on Market Street. Simply go down Broadway where it turns into Losoya and make a right on Market. The lot is $20 and should be open if you arrive around 5:15 p.m. The best part is that the elevator exit is a stone’s throw away from the NIOSA entrance next to the German Hall. 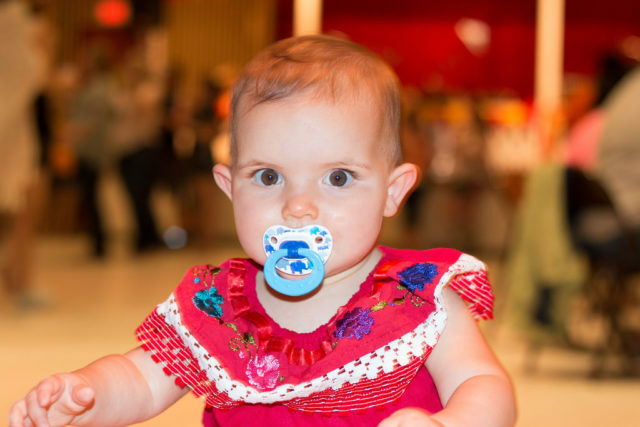 Natalie’s first ever NIOSA in 2015—we couldn’t pry her away from the German Hall dance floor. As soon as you walk in, snag some coupons. You won’t want to have to revisit the line, so I would suggest buying $40 for two adults with a couple of little ones. If you have too many, you can spend the rest on cascarónes (egg shells filled with confetti) along with a beer on the way out. OK, listen up because this is no joke. 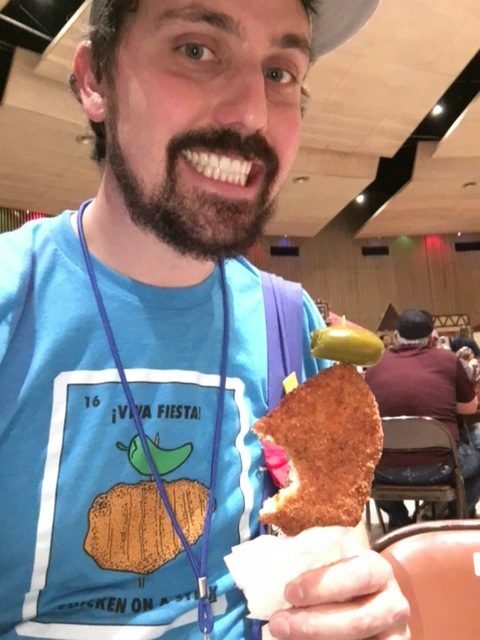 You know that you’re going to want a Chicken on a Stick (the most sought after Fiesta food and the inspiration for our 2016 Fiesta Medal), so make your way to the Froggy Bottoms area immediately. If you came in from the gate I suggested, you’ll pass the first road and hang a left into a little plaza terrace. DO THIS NOW to avoid a 30 minute (or even hour!) long wait. Don’t mess around with the Chicken on a Stick line, if you get there early buy it immediately! You can also get the shirt in the SA Flavor Store! You might want to split up and have your significant other go grab some treats for the little one(s). I’m a big fan of the Funnel Cake where the Country bands play—it’s to the right of the road where you’ll make a left to get your Chicken on a Stick. If you want to be a little healthier, there’s a fruit cup stand nearby as well. You’ll want to have a place to meet up, so I’d suggest setting up the rendezvous point inside the German Hall. The German Hall is the oasis of NIOSA. It’s air-conditioned, beer is abundant (though they no longer serve German beer, a travesty that needs to be remedied), bathrooms are available and a Polka band is playing. This is a great place to sit down, relax and eat your food in a comfortable environment—and by showing up early you’ll be able to get a seat. Natalie chilling out inside the German Hall at NIOSA. I love the band and it’s a great place for the little ones to run around and dance in the middle. They do the Chicken Dance almost every hour and it’s a lot of fun to participate in with a hundred or so of your new best friends. And the cloggers are a lot of fun to watch—be sure to stay for their dance to The Proclaimers “500 Miles” song. NIOSA is a lot of fun to wander around—not only are there bright colors and huge Fiesta hats, the light is perfect at this time of day to get some good photos. Cascarónes are a huge hit with kids and they’ll love cracking them on you (you can get three of them for a ticket). And don’t even bother protecting the top of your cup—as I’ve always said it isn’t Fiesta without confetti in your beer. Family portrait at NIOSA, full of confetti! 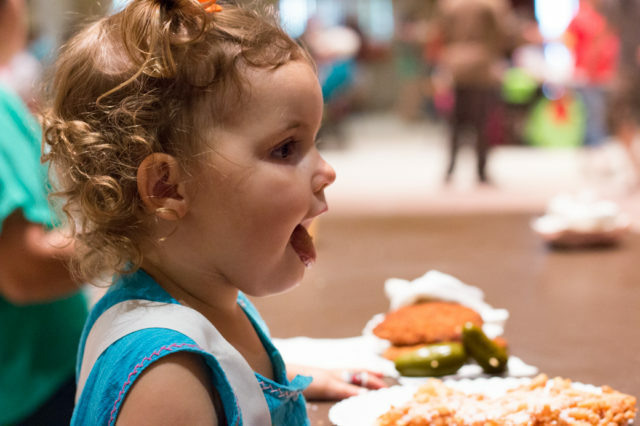 So while a lot of your friends might say, “You want to take your kid to NIOSA?! Are you CRAZY? !” Rest assured that it can be done. But there’s a little bit of rolling the dice. Last year, Natalie was super into the festivities and we had to basically pry her off of the German Hall dance floor. This year, she was a little fussy so we had to go home. Total price (if you buy advance tickets) would be $84. 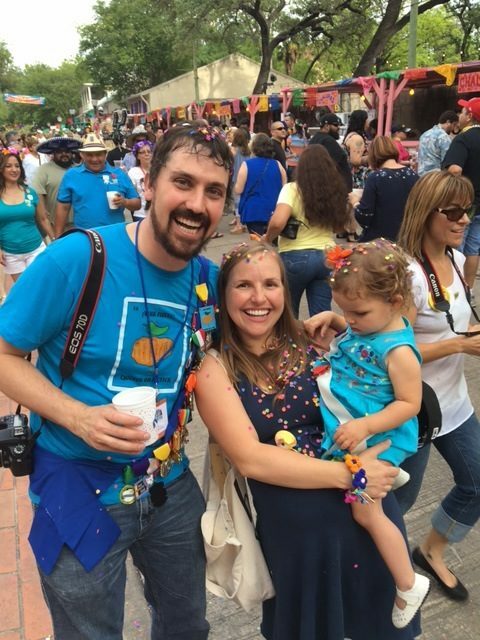 And while that may be expensive, I think its worth it because: (1) I didn’t have to pay a babysitter, (2) I got to share my love of Fiesta with my daughter and (3) I got some great pictures. ¡VIVA!